Talla and Taucher have been an example or even idol, for those who started to like trance music back in the 90’s in and outside Germany. Together they conquered the world from out of the legendary club called “Dorian Gray” located at the airport in Frankfurt. Miami, Ibiza, UK or even Israel: they have rocked all stages. After more than eleven years working on solo projects it came to this spectaculair comeback. Once more they’ll tour through Germany and Europe, and electrivy the crowd with awesome songs and remixes from Faithless – ‘’God is a DJ’’ to Rank 1 – ‘’Such is life”. Of course the first ever Technoclub anthem “Together” will not fail. 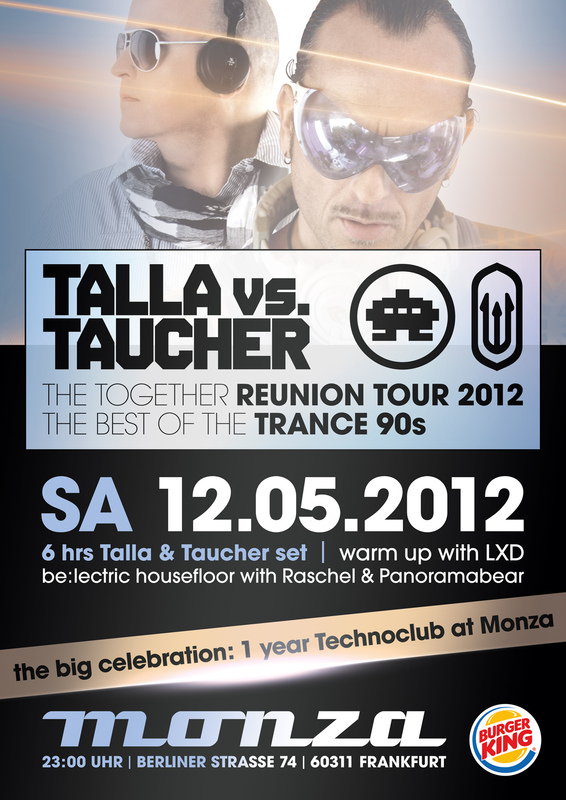 At Monza Talla and Taucher will share the decks for at least 6 hours! That means, a classic firework and thrilling atmosphere like ‘’in those days”! Who has been there before in the past, it will be a sort of flashback, and for those who couldn’t be there because of the age, shouldn’t miss this unique chance at all. The popular Technoclub-Resident LXD will take care of a proper warm up. Because Technoclub is a place where all members of the electronic family should be able to find their ‘’livingroom”, turntable wizards Christian ‘’Raschel” Radtke and Panoramabear will play the best deep- and techhouse tunes. This makes it possible to celebrate until early in the morning! Get infected – WE ARE TECHNOCLUB!